We are a mere few nights removed from Cedric Alexander defeating Drew Gulak in the Summerslam Pre-Show and remaining the champion of 205 Live. It’s hard to hide my disappointment with another wrestler bursting with character falling victim to the so-so Cedric. On top of this, the match (whose build was predicated on the threat of Gulak’s dragon sleeper “Gulock” finisher) had only a fleeting glimpse of said threat and failed to provide a finishing move proper from either man. Safe to say that your resident 205 Live reporter’s love of the Division took quite a hit. Nevertheless, let’s see what this week’s show brings. 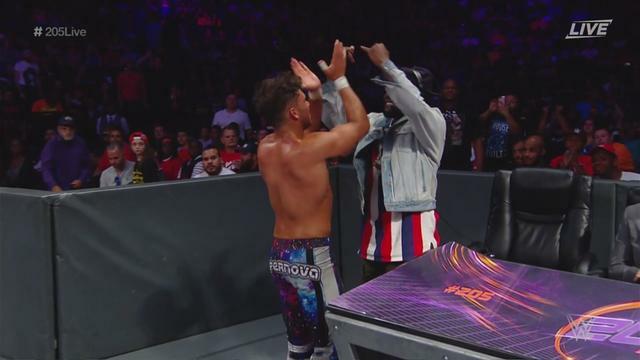 After highlights of Sunday’s match, 205 Live General Manager Drake Maverick advises that the opening contest for tonight will be a rubber match between Noam Dar and TJP. The main event will feature a Tornado Tag Team match between Gran Metalik & Lince Dorado, and Tony Nese & Buddy Murphy. Nigel McGuinness, Percy Watson, and Vic Joseph are on commentary tonight. They are joined by Grammy-nominated rapper, Wale. TJP’s entrance music is cut short, allowing time for him to trash-talk the Brooklyn crowd, and tonight’s opponent, Noam Dar. The first match between these two saw Dar defeat TJP in thirty seconds, while the rematch had TJP work his submission game to grueling perfection with a tap-out victory. Tonight’s rubber match will grant us a decisive victor in this mini-feud. Early on, TJP rolls out to the floor away from the confident Dar, and once again addresses the crowd with a microphone in hand. He welcomes Wale to the show, stating he’s here not to see the Cruiserweight, but rather the “Cruisergreat”. His follow-up dab is met with a bewildered look on Wale’s face. The awkward exchange is short-lived, with Dar’s baseball slide knocking TJP and his microphone to the floor. Wale and Dar bump fists before the action heads back inside. Dar begins to dominate TJP with a series of stiff strikes. A high dropkick rocks TJP on the apron. A rocky start for the inaugural Cruiserweight Champion, but a sudden DDT brings him back into the match. Dar attempts a fightback, but TJP’s submission skills come to the fore. A modified Indian deathlock keeps Dar grounded. TJP looks for a somersault over onto Dar, but the Scot brings his knees up, halting an attack. The counters from Dar don’t seem to be phasing TJP so much. The angry TJP turns his attention onto Dar’s surgically repaired knee. But Dar, fighting for survival, brings as good as he gets. This is quite the physical match-up so far. Dar kicks out at two after a sudden victory roll from TJP, but this, unfortunately, transitions into TJP’s inverted kneebar submission. Dar’s refusal to go back onto the injured bench has him scrape and claw towards the bottom rope. TJP is tenacious, however, as he looks for a submission in among the ropes. Once again, Dar’s survival instincts kick in, as a series of stuff punts to TJP’s shoulder follow. He gets to his feet and swipes TJP’s feet out from underneath him. The match comes to a quick end with Dar landing his high running kick for the victory. Dar celebrates at ringside and seemingly invites Wale backstage to celebrate. It was a shame that this match was relatively short, as the physical battle was the most violent of the two. Drew Gulak is in a pre-recorded video, bemoaning how Cedric Alexander got lucky with his win on Sunday. Gulak subsequently demands a rematch. We cut to Maverick being interviewed backstage. He praises the 205 Live locker room, and how they all deserve a chance to take on Alexander. With that in mind, Drew Gulak’s request is denied. Tozawa has had a bad run of results of late, with Lio Rush getting the better of him in a recent feud. His misfortunes continue this week (as do Colin Delaney’s), as Drew Gulak and his cohorts, Jack Gallagher and Brian Kendrick, rush the ring and knock down the competitors in this match. Drew Gulak takes the mic and warns that there will be no more wrestling on 205 Live until the matter of his rematch is addressed. Cedric Alexander comes out, looking to shut Gulak up. 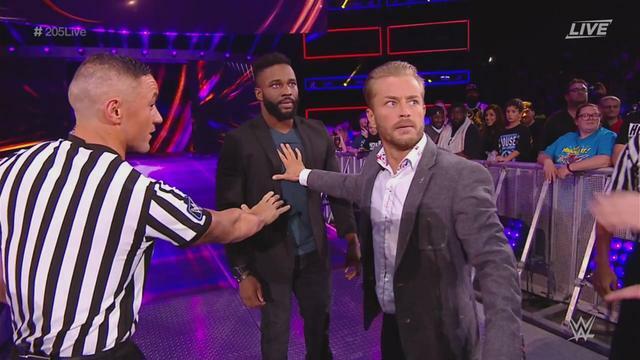 Drake Maverick comes out, holding Alexander back. Gulak mocks the champion and the “Age of Alexander”. Gulak wants a better 205 Live, looking furious. A chant of “let them fight” rings out from the crowd. Alexander escapes Maverick and some referees, and sprints to the ring. Gulak slithers out and makes his way out of the arena with his teammates. It would appear this rivalry isn’t over after all. This was a pretty intense segment. I have to wonder where this build was in the lead up to a match at one of WWE’s “Big Four” PPVs? The Lucha House party are seen warming up before their tornado tag team main event. The previous match between these two teams failed to deliver the incredible action that I know they are capable of. With the Tornado Tag rules (no count-outs, tags, or disqualifications), this could be a riotous bout more befitting of the competitors involved. After an initial stramash, Dorado & Metalik clear the ring. Nese & Murphy’s reentry attempts are met with stereo enziguris. The mimicked offense continues, reaching a peak with top rope springboard moonsaults by the Lucha House Party men. Nese and Murphy single out Dorado with a stiff running forearm, and a subsequent throw of his head onto the ramp. They make their way back to the ring and catch an airborne Metalik, flooring the King of the Ropes with a double powerbomb outside. Later, Murphy stands on Dorado’s injured hand as he comes back into the action, but Metalik makes the save with a series of excellent rope assisted offense, felling Murphy and then Nese. He looks to land a missile dropkick on Murphy, but the Australian catches him and drops him with force. A tandem move takes Metalik out of action. Dorado’s lucha wrestling is used expertly next. With Nese and Murphy homing in on Dorado, the Golden Phoenix turns their tandem offense into clumsy bumps and falls into one another. After a genuine and unfortunate slip up, Dorado floors Murphy with a tornado DDT, knocking Nese off the apron with his feet in the process. Dorado vs Nese and Murphy has been the main feature of this match, with Metalik offering minimal but impactful support. This theme continues as Metalik stops Nese and Murphy from doing untold damage to Dorado upon the turnbuckle. What ensues can only be described as a 100mph flurry of moonsaults and power moves, the action so fast it would be difficult to put into words. All four men lay flat on the mat after the exhausting sequence. Dorado looks for a Frankensteiner to Murphy on the top rope, but Nese comes to the rescue with a devastating elevated German suplex, crashing Dorado to the mat. Nese has no time to recover his energy, as Metalik walks the ropes and connects with a dropkick. Murphy exacts quick revenge on Metalik in the form of a “meteroa”. The four are stood in a square formation, throwing stiff strikes towards to their opponents. The standoff breaks down with Dorado landing a moonsault. The match looks to be over, but Murphy breaks up the three count at the very last second. Nese almost repeats the roll-up victory from two weeks ago, but Metalik kicks out. Outside, Dorado flies through the air, but Murphy dodges the attack, and Dorado spills to the floor. Up on the apron, Metalik walks the ropes again and throws Nese onto his tag partner with a hurricanrana. The crowd is lapping up this frighteningly paced bout. Metalik goes back inside to run the ropes, but his return leg is met with a vicious knee to the face. He follows Metalik outside and then rips Kalisto’s vest. Kalisto has been quiet so far as he supports his team at ringside. Considering how distracting the Lucha House Party can be, it’s a testament to the incredible action on offer tonight that it was easy to forget Kalisto was even in attendance. 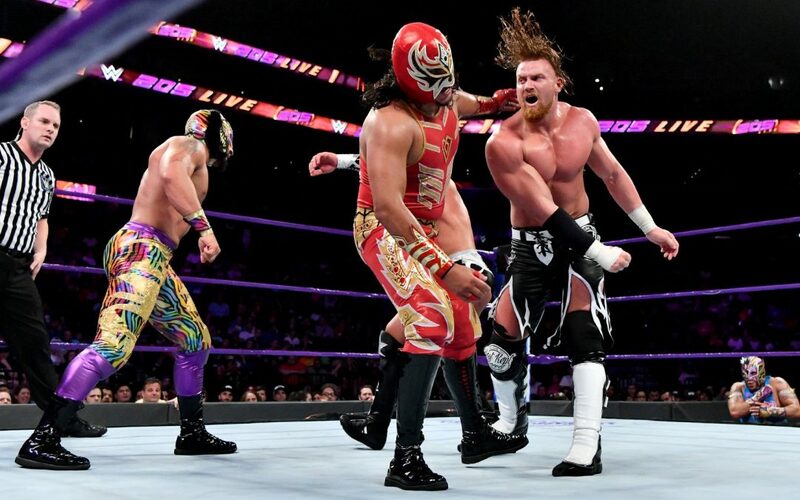 As fate would have it, Kalisto’s only involvement in the match – grabbing Murphy’s leg as he runs the ropes, – is the deciding factor. The distraction allows Metalik to reverse a powerbomb attempt into a Code Red powerbomb of his own. The referee counts to three, and Lucha House Party are the victors. I won’t lie to you, this match was almost impossible to keep up with from a viewing perspective, never mind reporting on it! A fantastic outing from all wrestlers involved. For anyone who would rather see all out, high flying action on 205 Live, I can’t recommend this match enough. This, as well as the escalating animosity between Cedric Alexander and Drew Gulak & Co, has done a good job of taking the sour taste out of my mouth following the somewhat disappointing Summerslam match. Check out the latest “Ricky & Clive Wrestling Show” on the Social Suplex Podcast Network.